I’m not a shallow person, but when it comes to eating I like my food to look pretty. When you have to give up salt, you expect a little something MORE in the looks department, if you know what I’m saying. Plus I have kids. Kids make fun of everything and there’s a reason kid friendly food all looks a certain way. Namely, not like “other stuff” (I’m talking to you, Refried Beans). Puerile humor aside, if food can’t look good then it better taste FANTASTIC. Pot roast is one of those dishes teetering on the edge of ugly. Anything that spends hours simmering away is bound to lose color, texture and appeal, but what pot roast lacks in looks it certainly makes up for in flavor. Today’s dish is my melding of the two; a low sodium recipe I concocted to not just taste great but look pretty too. Thanks to the medley of veggies, it has an eye-catching array of color and unbelievably appealing flavor. 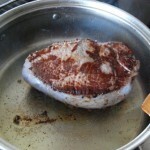 The long, slow cooking process leaves the meat falling-apart-succulent and juicy. And the kale tossed in at the end lends a last bright splash and extra vitamins (but don’t tell the kids). When serving, be sure to plate the cooked food with an ample amount of broth and bake a batch of salt free Simple Bread Rolls ahead of time for dipping! 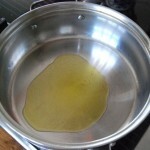 Heat the olive oil in a large saute pan over medium-high heat. 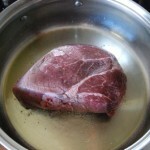 Once the oil is hot, add the beef roast and brown well on all sides. Once brown, remove pan from heat and set aside. 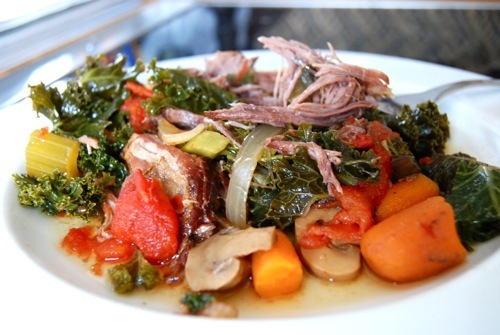 Combine all of the ingredients EXCEPT KALE in the slow cooker. 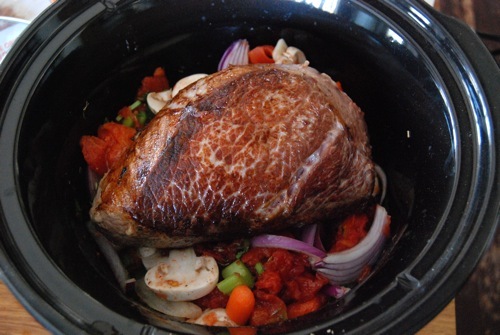 Place the browned beef roast on top. Cover and set to high. Cook on high 5-6 hours. About 20 minutes before serving, add the kale. Cover and cook until wilted. Serve immediately. that looks DELISH! i just made pot roast last month (but left out the bay leaves and other weirdo flavors the recipe called for). 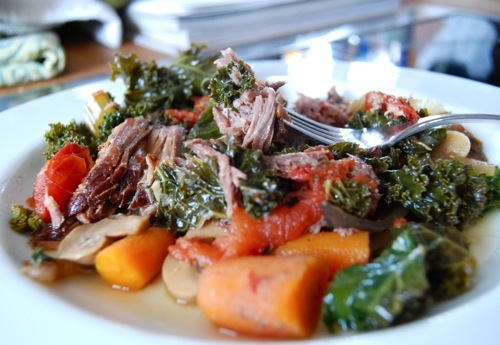 it was really good–perfect winter food–but i never thought to add kale or mushrooms. you’re always an inspiration! ps. i’m COOKING this weekend on my blog. drop by and drool, won’t you??? Ah, thank goodness your comments are open again. Yesterday freaked me out. That hunk of meat is glorious. And I met someone the other day who said he likes raw carrots but not cooked ones. But COOKED CARROTS ARE LIKE CANDY. yummm i love slow cook food. i add green beans at the end sometimes to give a crunchy taste. my father loved to make stew and used to have variations. his favorite was a cup of coffee and peanuts! wacky. that is the good thing about stews, you can be creative. Katie — Oh my goodness – YES. You don’t even need to toss them with butter and brown sugar and cinnamon.. or chocolate. PERFECT as is! Yeah sorry about the comments. I was really pressed for time yesterday — had to do the post, then walk the dog & jet to a field trip for Maddie. No time for things like proofreading or checking comment boxes – or even Lunch. I didn’t eat anything until 3 o’clock. It gets ugly when I don’t get fed. Creativity when you’re cooking without something (like salt) is especially important. Love the green beans idea. The beauty of so many recipes like this — especially slow cooker recipes – is you can use or substitute so many different things, making seasonal variations year round. Wowza – that does look good! I pretty much know how to cook only one thing (that doesn’t come directly out of a can), and I’m lucky when that even tastes good! I did try to make ratatouille once… which actually did look nice, but it tasted AWFUL! I’m not sure exactly what I did wrong, but I sure didn’t do much right! HAH! I’ve think we’ve all been there. I once made the most beautiful banana bread, before realizing I forgot to add the sugar…. UUuuugh. No thanks.